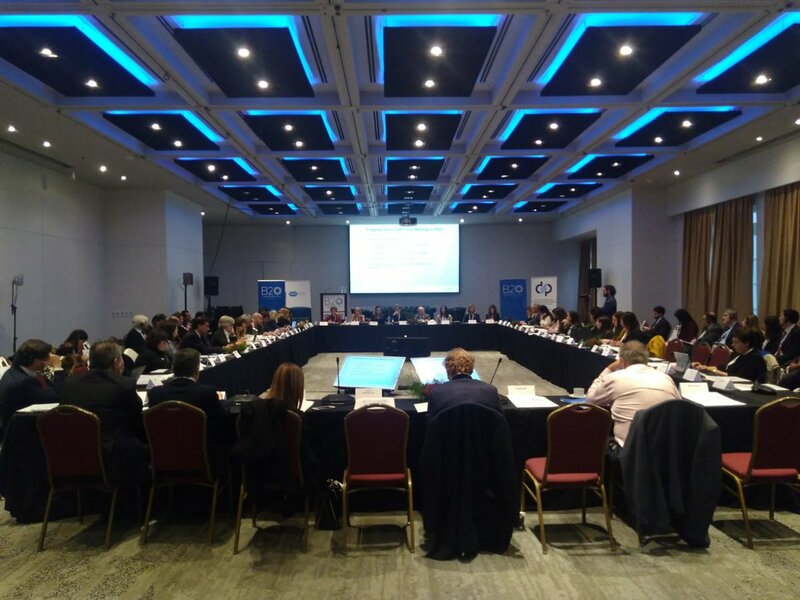 Recently in Buenos Aires, alongside the Group of Twenty (G20) Finance Ministers’ and Central Bank Governors Summit, IFAC hosted a high-level anti-corruption event with the Business 20 (B20) and IFAC member organization, Federación Argentina de Consejos Profesionales de Ciencias Económicas (FACPCE). The event brought together leaders from the G20 policy forum, business, and professions, to focus on collective action for tackling corruption worldwide. The G20 is the leading forum of the world's major economies to develop global policies that address a range of today’s most pressing challenges, including the future of work, infrastructure for development, and sustainability. The B20 is the private sector´s voice of the G20 community. This year, Argentina is hosting the Forum. IFAC has put its engagement with the G20 and B20 forums into overdrive in the past few years, and has worked closely to emphasize and progress the essential role of the global profession on key topics. In 2018, we became an official “Network Partner” on Integrity and Compliance. IFAC President Rachel Grimes has also been appointed to the B20’s international business advocacy caucus, a group of prominent business leaders who work with Ministers and Leaders to enhance the visibility of B20 policy proposals and recommendations. It’s fair to ask why accountants must be so engaged in these discussions. Although the discussions and policy at G20 are focused on broad topics such as finance, anti-corruption, and SMEs, the policy instruments issued by the G20 have teeth, and drive regulation that impacts the profession when it comes to tax, anti-money laundering, financial reporting, audit and more. In many cases, the accounting profession is a vital part of the solution to the big picture issues that the G20 are tackling – in this instance, fraud and corruption. Having a seat at the table means we know what’s being discussed, and we can inform and help shape sensible approaches to policy that enable the profession to contribute as effectively as possible. The role of the profession was also noted by other influential participants at the event. Laura Alonso, head of the Argentine Anti-Corruption Office, said on the private-public sector collaboration panel: “accountants are a vital asset in the fight against corruption -- collective action is essential”. IFAC President Rachel Grimes implored delegates to work collaboratively across the public and private sectors, to enhance public sector financial management, and to seize the potential in evolving developments such as integrated reporting and new technology that can bolster the global fight against corruption. IFAC Chief Executive Fayezul Choudhury emphasized the value of the recent Non-Compliance with Laws and Regulations (NOCLAR) standard issued by the International Ethics Standards Board for Accountants (IESBA), which clarifies how professional accountants can respond if they come across instances of corruption. He also highlighted the need for governments to enact laws that protect and enable professionals to act effectively and without retribution when they are faced with corruption or other illegal acts. The importance of professional advisers in the SME space. As part of the activities surrounding the Anti-Corruption compact, IFAC recently issued a joint anti-corruption mandate with the International Bar Association, the world’s leading organization of international legal practitioners, bar associations and law societies. All of this highlights the vitality of accountancy as a global profession and the role it plays to advance a corruption-free economy. While much has been achieved, in many ways we’re just getting started. This kind of advocacy and engagement would not be possible without a strong global network and the essential collaboration among IFAC’s members -- a special mention to FACPCE and President Jose Arnoletto, who have been instrumental to IFAC’s engagement with the Argentine G20 cycle. Amir Ghandar is a Deputy Director, Public Policy and Regulation at IFAC. Previously, Mr. Ghandar led auditing and assurance policy at CPA Australia, has worked in auditing and insolvency with major professional firms including Ernst & Young and Grant Thornton, and lectured in masters courses at major Australian Universities. He is a fellow of CPA Australia and member of Chartered Accountants Australia and New Zealand.